There are few things as relaxing as a trip to the spa, and receiving a body wrap treatment is a terrific way to restore the spirit and replenish the body. There are several types of specialized body wraps offered these days, and the magnificent Spa Imagine at the Garza Blanca Preserve is the ideal place to try one out. Nourishing oils, detoxifying clays, exfoliation rituals and herbal aromatherapy fusions are all common elements of body wrap treatments, chosen to suit your individual needs. After a blend of products is applied to your body, you will enjoy some calming quiet time while you are all wrapped up. Materials such as plastic wrap, cloth bandages or a sheet are used to ensure your body receives all of the benefits the body wrap can offer. You can look forward to exiting the spa after your treatment feeling a splendid sense of physical and mental renewal. Many body wrap elements are able to help detoxify the skin, particularly natural products such as various types of sea salt, seaweed, algae, and mineral-rich clay or mud because they all help to draw toxins and impurities from the skin through the pores. The results of a body wrap are noticeable immediately; the tone and appearance of your skin are improved once the toxins have been removed, giving skin a youthful, radiant glow. Body wraps are renowned for their incredible ability to hydrate thirsty skin, which is exactly why they are sought out by those who want a more luminous complexion. A nourishing body wrap can give skin a supple, smoother appearance. Often the primary step before a body wrap is applied, an exfoliation treatment is able to effectively lift dead skin cells away from the skin’s surface. The outer layer of your skin will have a more even look and a lit-from-within radiance will have you looking and feeling amazing. Body wraps are a popular choice for individuals who have an upcoming important event to attend because they can give the body a sleeker appearance that for some individuals can equal dropping a dress size! While the effects are quite temporary (one or two days, maximum), it is definitely a technique worth trying for a quick fix. Since the body holds onto excess toxins and water, a body wrap is a great tool when you want to flush them out, leaving you with skin that appears tighter and more toned. The physical benefits of a body wrap are often the biggest reason to get one, yet the rituals of each treatment are also deeply relaxing, too. Each step of the treatment feels lovely and ushers in a deep sense of tranquility, from the application of exfoliating and moisturizing products, to the mellow bliss you experience once you are all wrapped up. The calming downtime that is built into a body wrap treatment provides a lovely break from the stresses of reality. 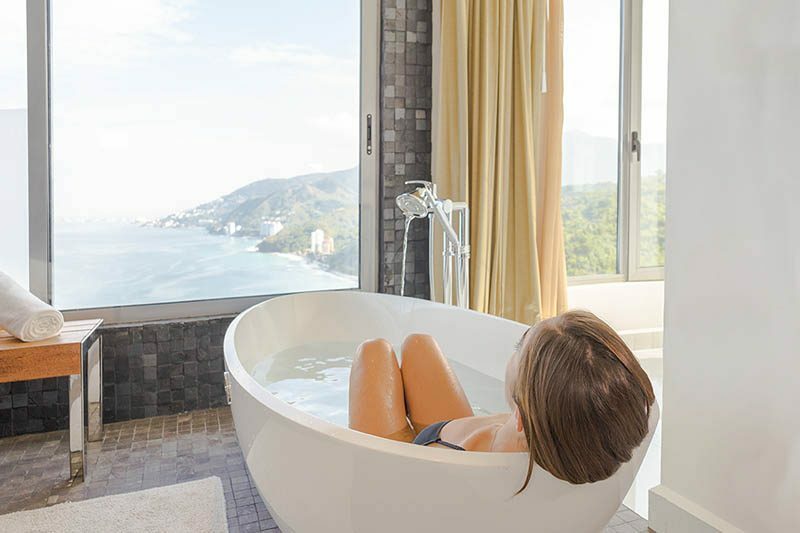 During your next stay at Garza Blanca, why not treat yourself to a blissful body wrap at Spa Imagine? The calming yet detoxifying effects of the Green Tea & Seaweed Body Wrap will increase moisture in the skin, which begins with a body scrub, moves on to a quiet time of reflection while the wrap goes to work, and finishes with a blissful full-body massage. The Vitamin C Body Wrap is an ideal choice for those looking to turn back the clock on their skin’s appearance; thanks to the application of an antioxidant-rich citrus concoction, the epidermis is hydrated while improving skin texture and replenishing youthful firmness. For an unforgettably delightful spa experience, indulge your senses with a body wrap at Spa Imagine!